Magic Binds is book 9 in the Kate Daniels series. I was a bit sad that the audiobook didn't release with the hardback this year, but I knew I had to wait for it. I'm so glad I did, this series is a must read for any Urban Fantasy lover and the audiobook really brings the characters to life for me. A little refresher in case you don't remember Kate and Curran have parted from the pack and a few members went with them. Kate's father, Roland, has entered their lives and we're all just waiting to see how it's going to go. Kate has claimed Atlanta in a little power play with daddy dearest and we're not sure yet how it's going to alter their lives. In other words, I just knew something big was going to go down in this book and boy was I right. We start off with Kate and Roland arguing and you can see there's more tension forming between them. Kate doesn't want him near her land yet he's building a fortress right outside of it. Then we get the doozy that one of the witches foresees a war between her and her father in the very near future. With the future looking bleak, Kate and the gang are sent on a mission to derail that future at any cost. It takes them to some unexpected places and doing things I didn't see coming. 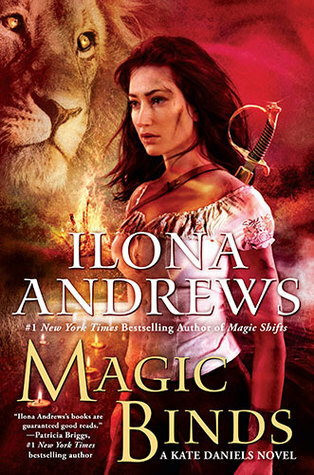 Magic Binds is a pivotal installment in the Kate Daniels series. We had so much going on in this book it was crazy. A few things we've been waiting on for forever now finally happened! Kate gets married, Andrea has the baby, and we find out more about Roland to just name a few. I was kind of scared on where this novel might lead, but after finishing it I'm just more intrigued and want the next book right now. If you haven't read this series yet, I highly recommend it to any Urban Fantasy lover. It's an addicting read that has laugh out loud moments mixed with action and paranormal. I was the same when I saw people's ebook/hardback reviews and I still hadn't gotten the audio. This one was a really good book, that's all you have to know haha! :P I adore this series, it's probably my favorite UF! oh you know I just love this review!!! I can't wait to pick this book up. I love Curran and Kate, and I am curious to see how they are in this one. I love how they balance out the plot and the humor so well. I'd have to start from the beginning. Not a bad thing, but something to consider. If you do start it, just know each book gets better as you go through the series. I think some people had a bit of trouble with the first few if I remember correctly. I didn't, but I think some people did. And if you do audios I highlyyyyy suggest this in that format! I agree about the frustration around the audiobook issue! I agree I really enjoyed this one as well! :D It was really good! Oh man. It sounds like this one if full of a lot of awesome stuff. I will admit that I've tried to get into this series but have been unsuccessful. Everyone loves them and the covers are gorgeous but I guess I'm just never in the right mindset when I try reading them. I'm going to keep trying though because this sounds like such a fascinating world. I have seem some people not enjoy the first few, but I do think with each novel it gets better and better. So maybe try when you're in the mood, though get them from the library just in case lol!! Great review! I've heard great things about this series and I'm hoping to maybe start this series next year. One of my goals will be reading more urban fantasy and this seems one of the best out there. Oh yes, I hope you do and love it!! Oh man, yes you have to read it!! I so loved this story. It was amazing. I loved the wedding stuff with Roman. That was so funny. I kinda knew something was going to go down with Roland. Not exactly how I expected it, but still. It will be interesting to see where the series goes from here. Great review. I had to wait for the audio too. The wedding stuff with Roman cracked me up too! And YEP I really thought something would happen with Roland and oh man were we right. Can't wait for the next book! !